Compact-Kitchen.Com, a leading supplier of compact kitchens, announces a preassembled kitchen that can be installed in 4 hours or less. When renovating a kitchen, most people could spend four months making the kitchen functional. Professional renovators can easily take four weeks and a crew of renovators could do the job in four days. A prefabricated kitchen can be installed in four hours (or less). The solution is not new; it is just not known to most people. The solution is a kitchen-in-a-box that comes premanufactured with the necessary elements of a kitchen all rolled into one. 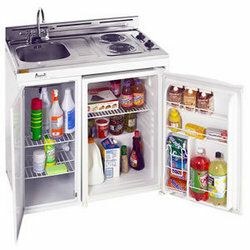 These modular kitchens are a sink, countertop, cooktop, refrigerator, freezer, and some storage space all in one unit. They are usually all-electric, and are available in sizes as small as 30 inches wide and as large as 60 inches wide. When a compact kitchen is installed, both money and effort are saved. Many do-it-yourselfers have a natural tendency to try to make what they see. The combined cost of the refrigerator, stainless countertop, range and sink may actually be greater than the cost of the premade kitchen unit, depending upon what is purchased and where. When installing a do-it-yourself kitchen, all wiring must be inspected to meet code. An code inspector will need to see that all wiring correctly run and guaged which slows a renovation down. The refrigerator is also be subject to inspection to ensure it has adequate venting to expel the hot air created by the heat exchanger. Also, refrigerators must be pre-rated for being enclosed for efficiency and fire safety reasons. A compact kitchen comes integrally, all wiring is pre-certified and the refrigerator-freezer is pre-rated for its use as a build-in. The connections from the wall to the unit are all that need inspection, which can be done at a glance. In some smaller compact kitchens, the compressor has been moved from its usual position at the back and underside of the body to inside the bottom storage cabinet. This makes for additional food storage where space is at a premium, and is something a do-it-yourselfer would find challenging, or even illegal, to attempt. Renovators prefer compact kitchens. Once wires and plumbing are run, the compact kitchen is placed and hooked up rapidly. Manpower costs are kept to a minimum, and the resident has a new kitchen with clean lines and efficient modern appliances. "Most of the sales we see are to individuals or their contractors", says Mark Goldman, who works as a commercial sales manager at Felix Storch, "we also have a lot of people renovating apartments, changing a building form one use to another." Compact kitchens have found their way into boats, RVs, dormitory rooms, cottages and small apartment conversions. When time is at a premium such as after natural disasters, sales of compact kitchens surge as building manufacturers rush to fill the void in temporary housing. Companies can quickly install a functional compact kitchen in a break room. This kitchen can be taken with them if and when they expand or move their location, without disruption of normal business activities. Every day that an apartment remains unrented is a day without income for the landlords. And the numbers become daunting when you own dozens of units that need to be finished before they can have tenants move in. The installation of a compact kitchen that may add as little as a single day to the availability of a rental unit has already paid for itself. "It's a numbers game" says Julia Howard, who shows tenants available apartments at a Charlotte complex. "You have to have the apartment ready for the right tenant at the time he is ready to see it". Sometimes there is no other choice, there is only 30 inches for a kitchen and no other alternatives are available. Compact kitchens have been put into every conceiveable nook and cranny one can imagine from installations under the stairs to in cabinets with louvre doors. They have a way of looking modern and efficient where everything else in a renovation has been a work-around. Kitchens are not just a sink, refrigerator, range and counter. There needs to be room for flatware, dishes and peripheral appliances like microwave ovens. To meet these needs, appliance stations have been a welcome recent addition. An appliance center is a shelf that mounts over the kitchen at just the right height for the microwave, blender and other accessories.